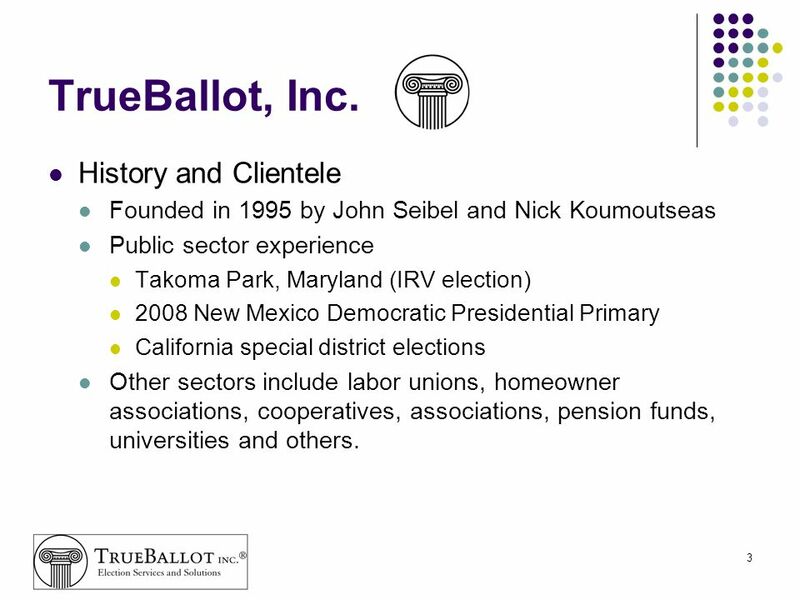 Founded in 1995 by John Seibel and Nick Koumoutseas Public sector experience Takoma Park, Maryland (IRV election) 2008 New Mexico Democratic Presidential Primary California special district elections Other sectors include labor unions, homeowner associations, cooperatives, associations, pension funds, universities and others. Full election services company using multiple media. 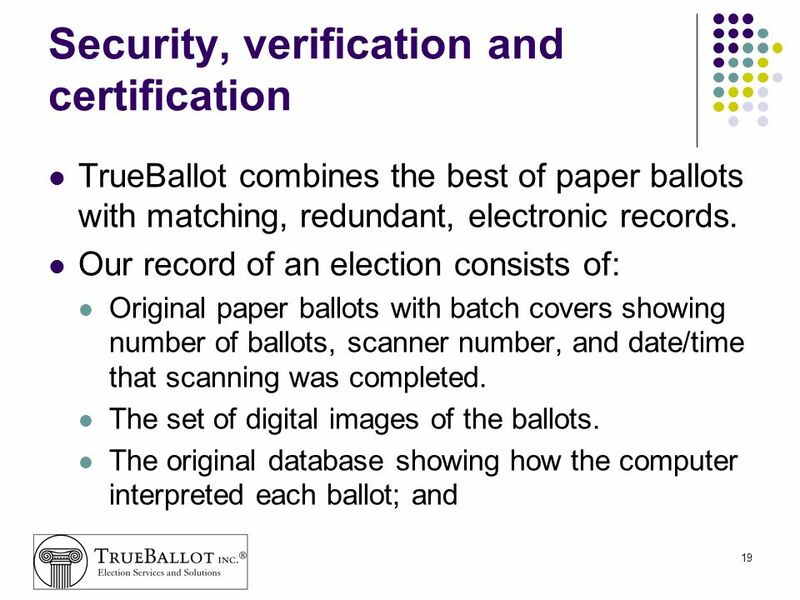 TrueBallot staff: Have conducted dozens of ranked-choice elections, including both instant runoff voting and single transferable vote elections, both public and private sector, with as many as 100,000 eligible voters. Wrote the San Francisco ranked-choice voting charter amendment and assisted with all facets of the implementation of RCV from , including voter education. 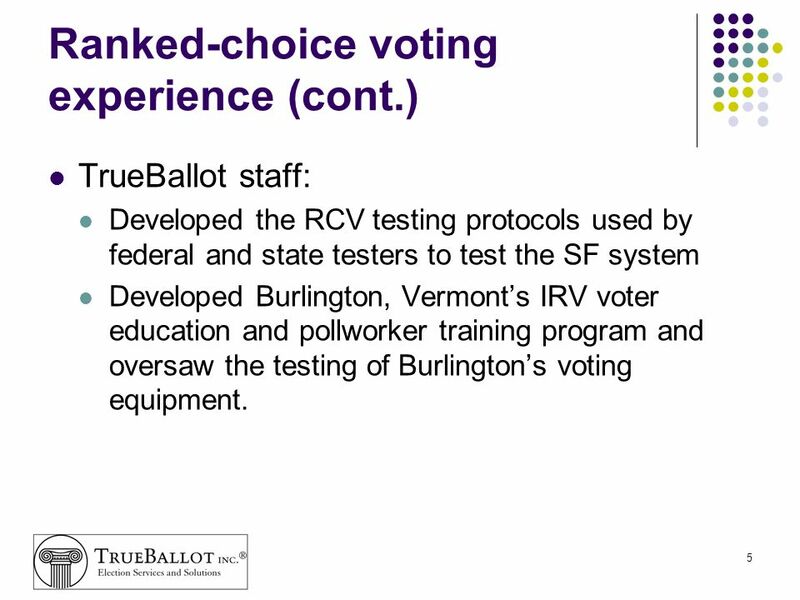 TrueBallot staff: Developed the RCV testing protocols used by federal and state testers to test the SF system Developed Burlington, Vermont’s IRV voter education and pollworker training program and oversaw the testing of Burlington’s voting equipment. 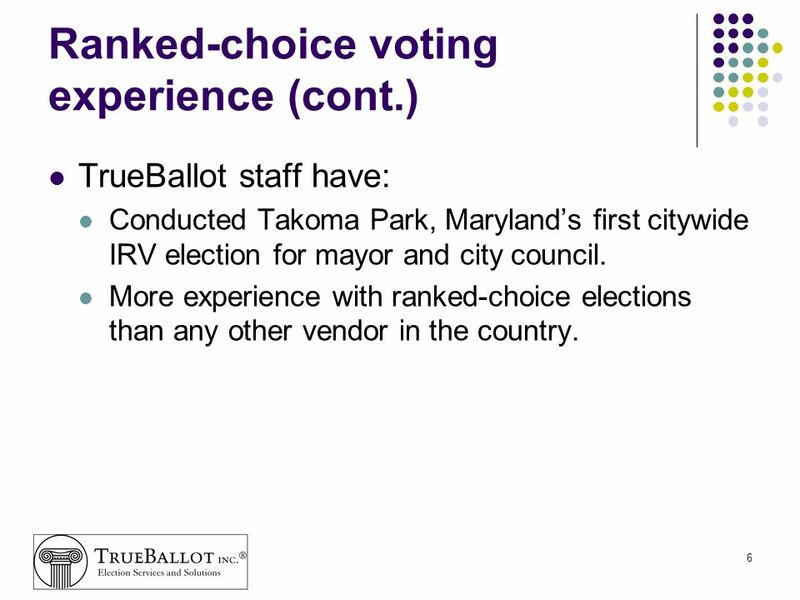 TrueBallot staff have: Conducted Takoma Park, Maryland’s first citywide IRV election for mayor and city council. More experience with ranked-choice elections than any other vendor in the country. Election date: Tuesday, November 3, 2009. ~131 precincts, ballot types. 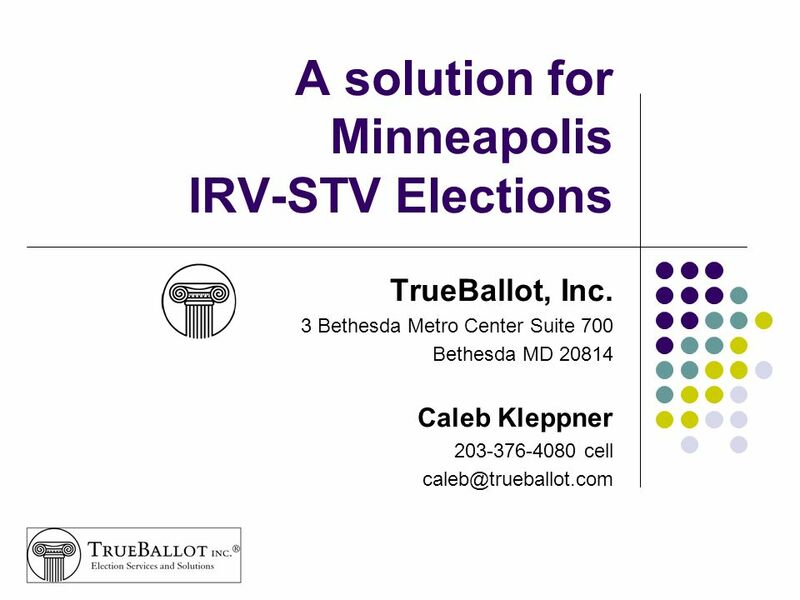 ~5 IRV/STV races, possible ballot questions. Double-sided, 8.5” x 14” ballot. Approximately 80,000 votes expected to be cast. No change to ballot format or polling place procedures. 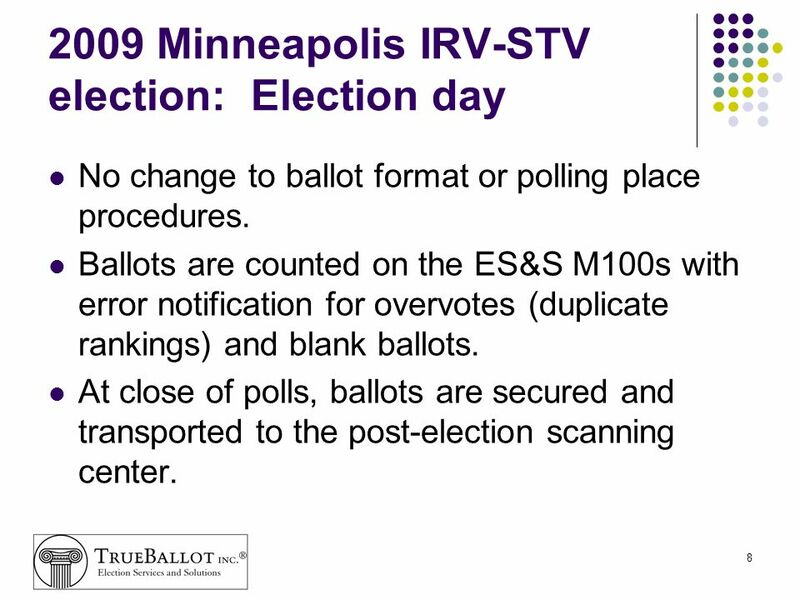 Ballots are counted on the ES&S M100s with error notification for overvotes (duplicate rankings) and blank ballots. At close of polls, ballots are secured and transported to the post-election scanning center. 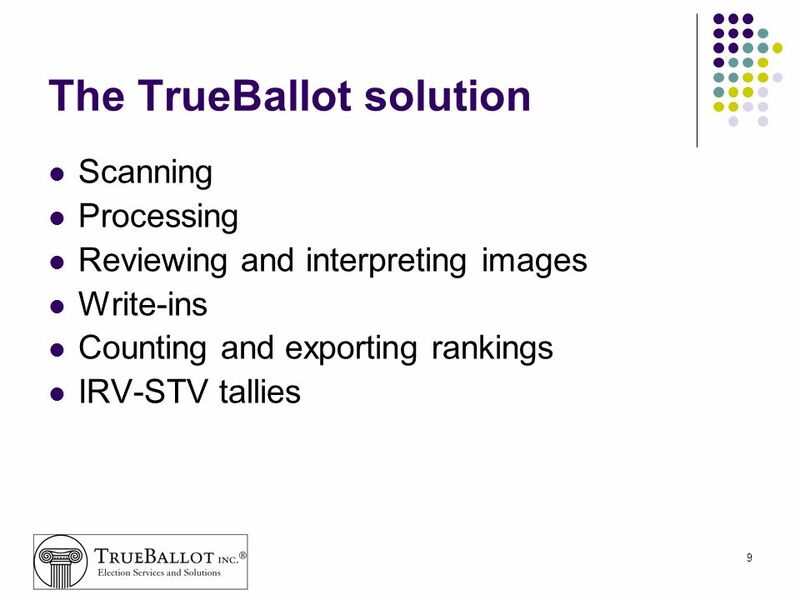 10 Scanning TrueBallot uses off-the-shelf image scanners to produce digital photographs of every ballot. 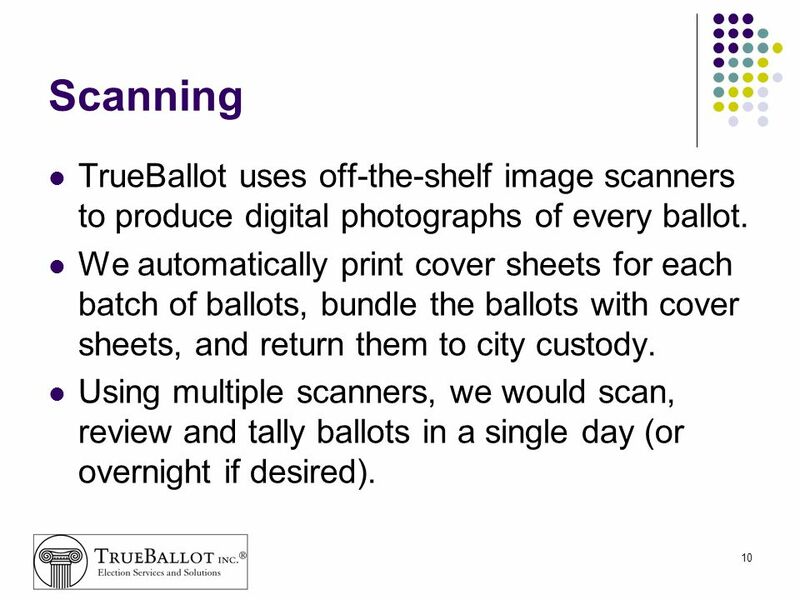 We automatically print cover sheets for each batch of ballots, bundle the ballots with cover sheets, and return them to city custody. Using multiple scanners, we would scan, review and tally ballots in a single day (or overnight if desired). 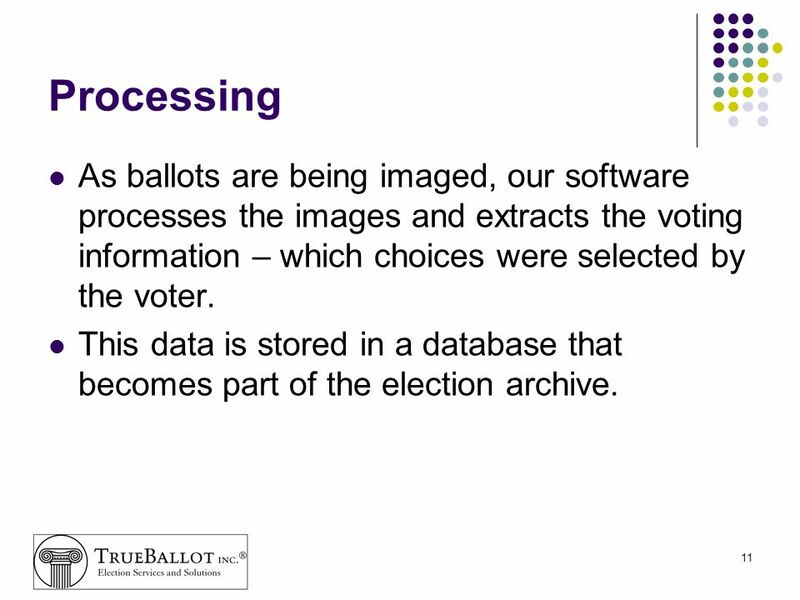 11 Processing As ballots are being imaged, our software processes the images and extracts the voting information – which choices were selected by the voter. This data is stored in a database that becomes part of the election archive. 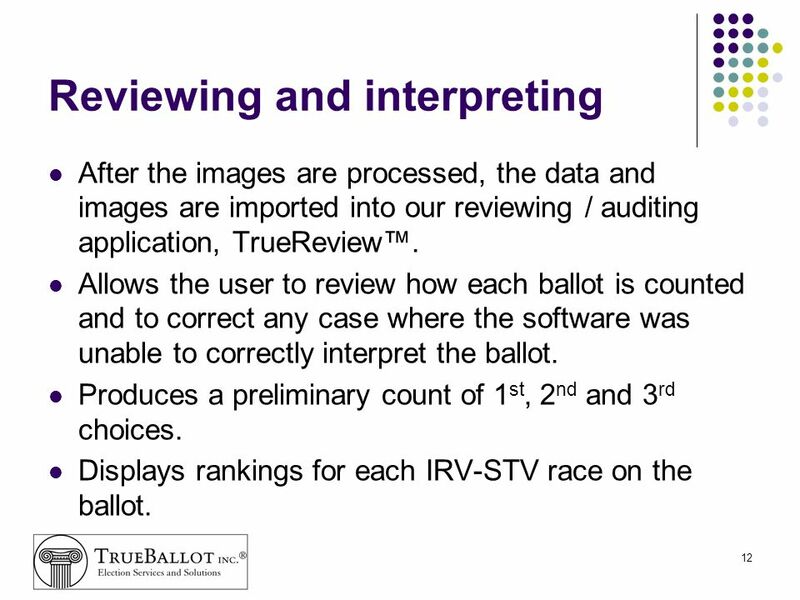 After the images are processed, the data and images are imported into our reviewing / auditing application, TrueReview™. Allows the user to review how each ballot is counted and to correct any case where the software was unable to correctly interpret the ballot. Produces a preliminary count of 1st, 2nd and 3rd choices. Displays rankings for each IRV-STV race on the ballot. 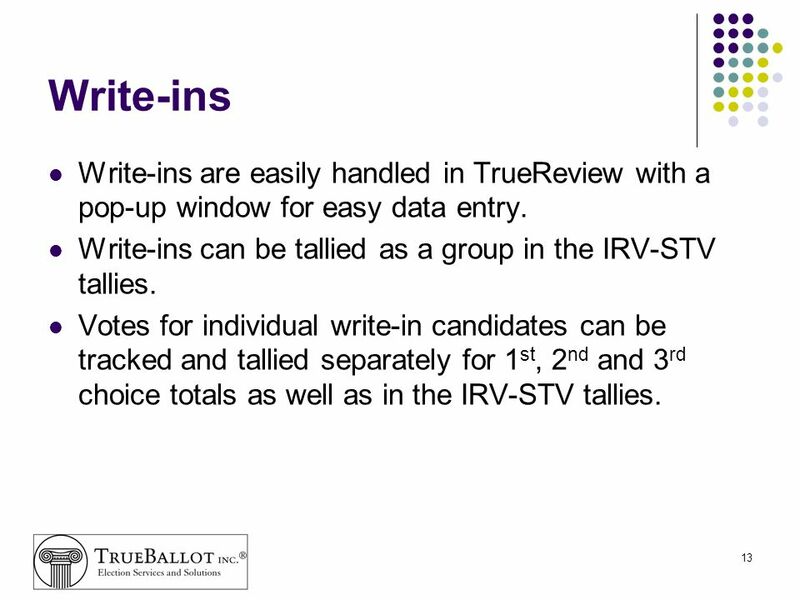 13 Write-ins Write-ins are easily handled in TrueReview with a pop-up window for easy data entry. 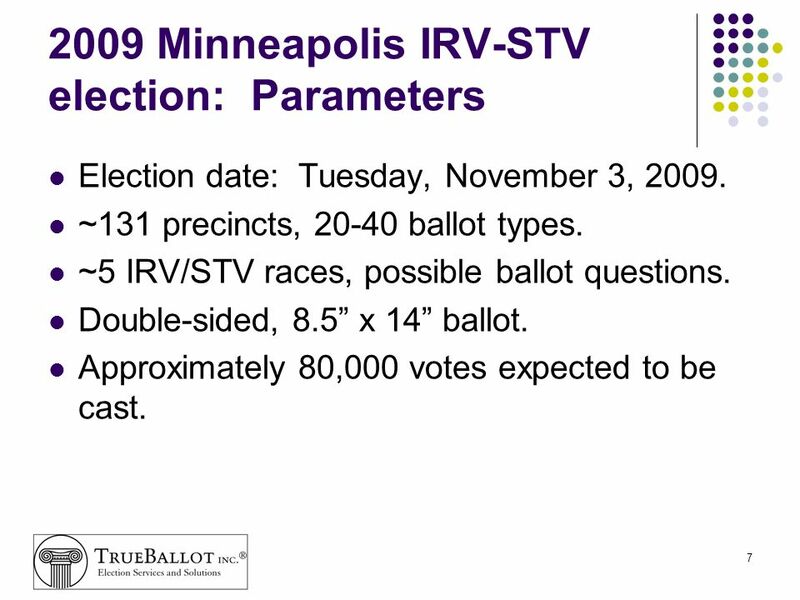 Write-ins can be tallied as a group in the IRV-STV tallies. 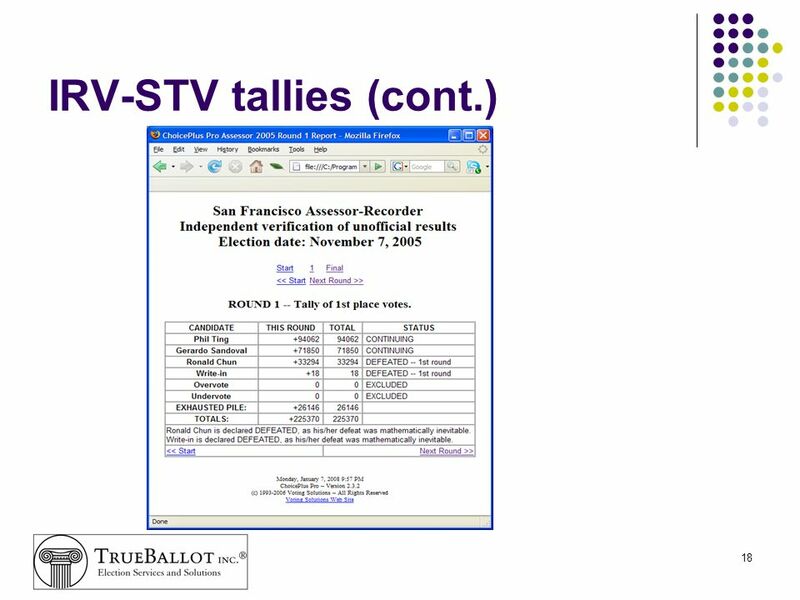 Votes for individual write-in candidates can be tracked and tallied separately for 1st, 2nd and 3rd choice totals as well as in the IRV-STV tallies. TrueReview automatically generates the rankings for each ballot. 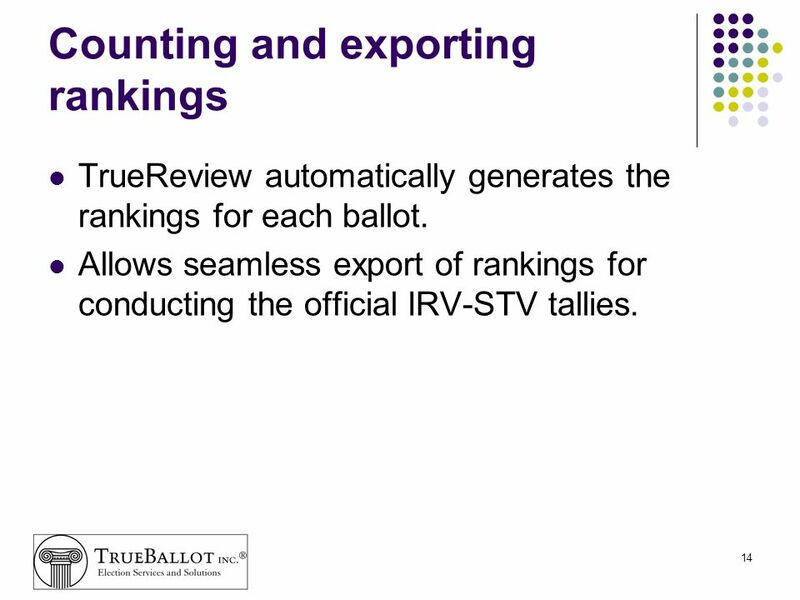 Allows seamless export of rankings for conducting the official IRV-STV tallies. The complete set of rankings for each IRV or STV race is exported as a text file for tallying. This completes the challenging part of the election. 16 IRV-STV tallies The easy parts of the IRV-STV election are the actual IRV-STV tallies. Once you have all the rankings, you can easily tally results in a spreadsheet or database program. 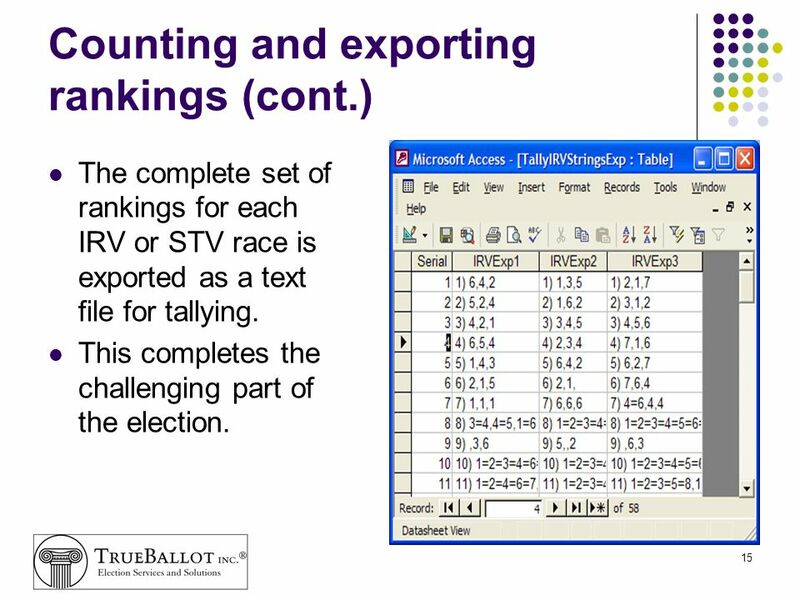 Or you can use the free, open source STV-tallying software used by Cambridge (MA) and Burlington (VT). 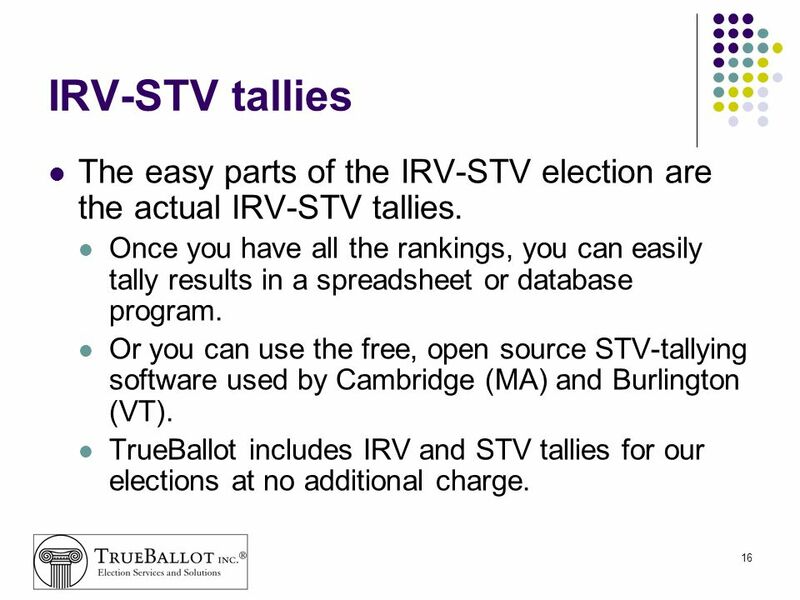 TrueBallot includes IRV and STV tallies for our elections at no additional charge. 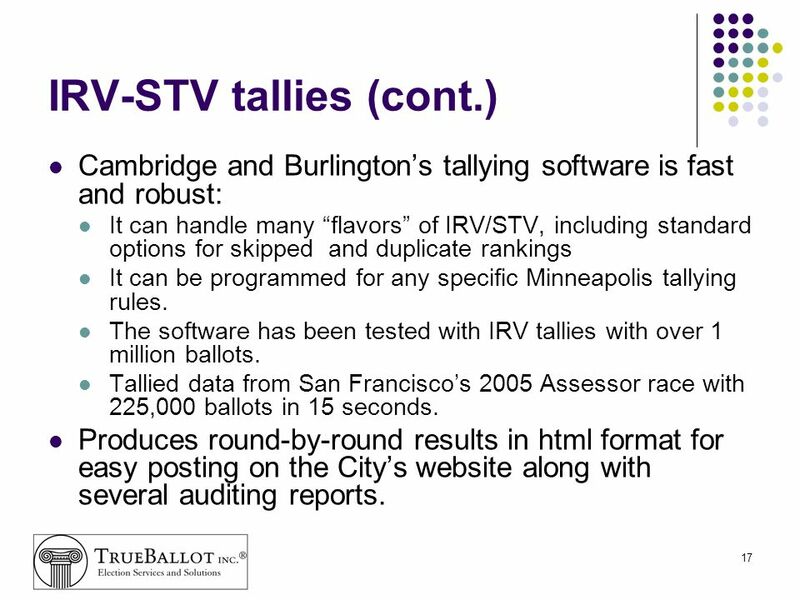 Cambridge and Burlington’s tallying software is fast and robust: It can handle many “flavors” of IRV/STV, including standard options for skipped and duplicate rankings It can be programmed for any specific Minneapolis tallying rules. The software has been tested with IRV tallies with over 1 million ballots. Tallied data from San Francisco’s 2005 Assessor race with 225,000 ballots in 15 seconds. Produces round-by-round results in html format for easy posting on the City’s website along with several auditing reports. 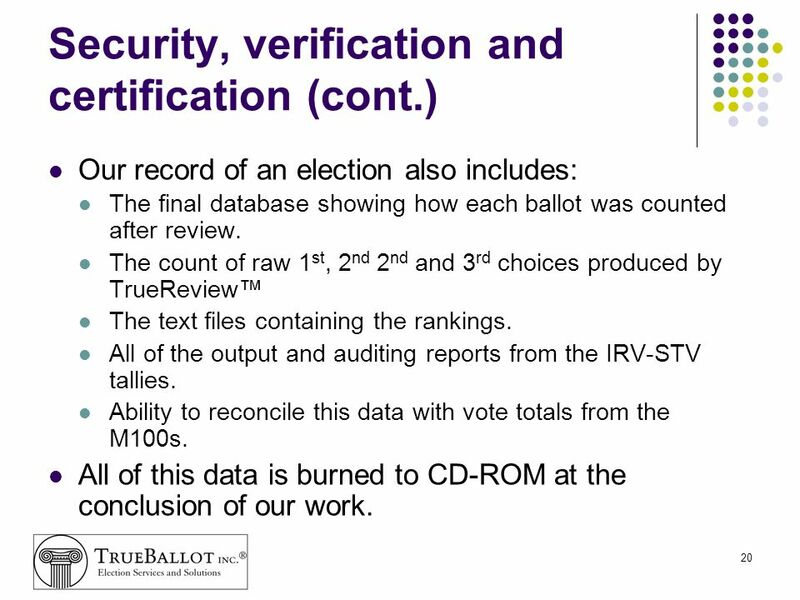 Our record of an election also includes: The final database showing how each ballot was counted after review. The count of raw 1st, 2nd 2nd and 3rd choices produced by TrueReview™ The text files containing the rankings. All of the output and auditing reports from the IRV-STV tallies. Ability to reconcile this data with vote totals from the M100s. All of this data is burned to CD-ROM at the conclusion of our work. 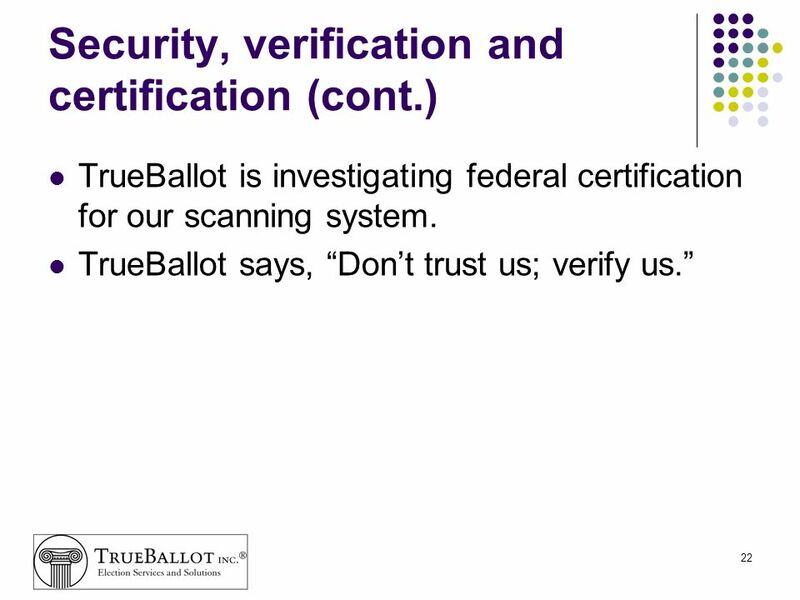 TrueBallot’s system is “self-verifying.” At the conclusion of an election, we produce data that allows the verification of the interpretation and counting of every single ballot. 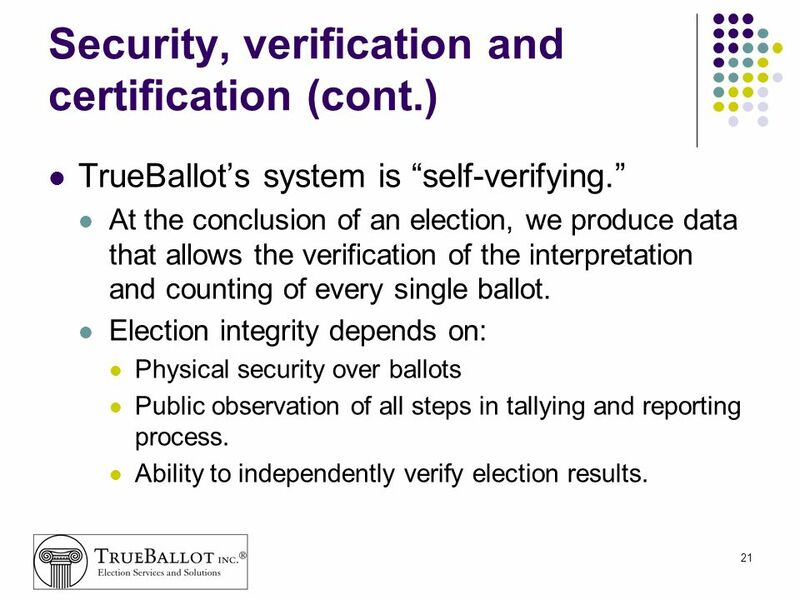 Election integrity depends on: Physical security over ballots Public observation of all steps in tallying and reporting process. Ability to independently verify election results. 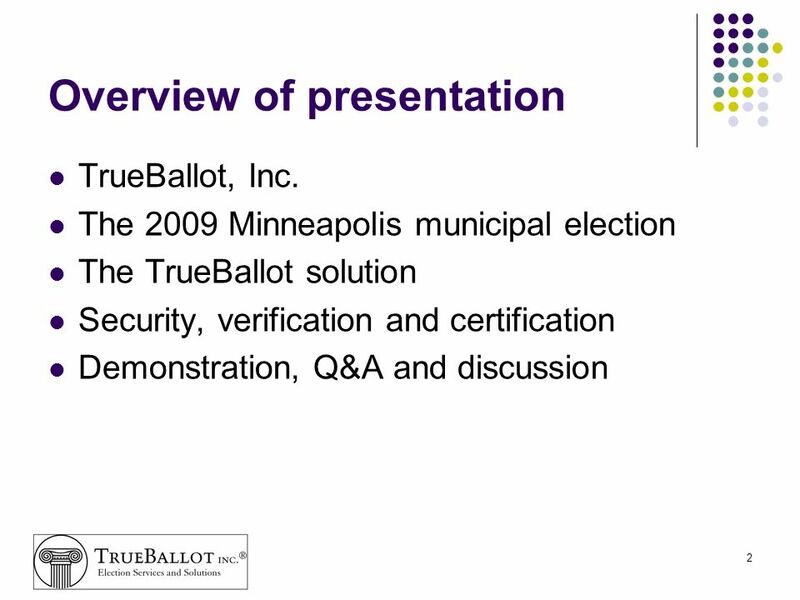 Download ppt "A solution for Minneapolis IRV-STV Elections"
Administrative Procedures for Provisional Voting Amy Strange NC State Board of Elections March 14, 2006. Post-Election Duties. Material Return to Hennepin County August 10 th – 11 th November 9 th – 10th.